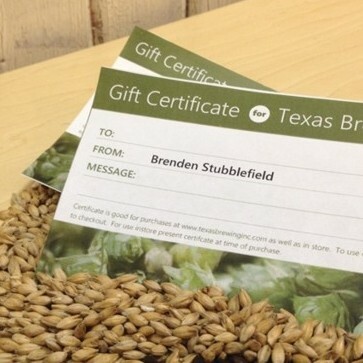 Buy your favorite brewer the gift of choice with our Texas Brewing, Inc. Gift Certificate. If you would like to email the gift certificate directly to the recipient instead of receiving it in your own personal email, select below and fill in the recipients details. It's simple, fast and easy! You have the option of receiving the gift certificate via your own email in a PDF file format. You can then print out and gift the certificate to the person of your choice. Or you can have the gift certificate directly emailed to the lucky recipient. Just mark the checkbox next to send to a friend. You can even select which day you would like us to email it to your recipient. Lost your Giftcode? Don't worry another PDF can be printed out. Log in to your account. From your account page you will see a button in the left column for (Gift Certificate) and select it. You will see your gift codes and the actions that are available. From the actions select the print option and you are all set once again! Can be redeemed online or in our store. Our Gift Certificates have no fees. Please note that this is a digital certificate. It will not be sent via mail, but via email to either the purchaser or the recipient.